A few days later Athenodorus himself came to the ludus, to meet Ahenobarbus and the gladiators including GALLUS who had achieved the great feat. Athenodorus personally gave generous gifts to all concerned to show his appreciation and bestow honour on the house of Ahenobarbus. GALLUS made a further 8 aureus out of this, taking his accumulated total to 35. 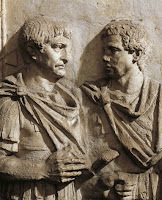 In a one on one meeting, Athenodorus advised Ahenobarbus that there would be private games at the villa of the Governor (Mucianus) in two days, and 'requested' that GALLUS be available to fight a new gladiator the Governor had imported from Capua. Ahenobarbus was naturally 'honoured' to accept. 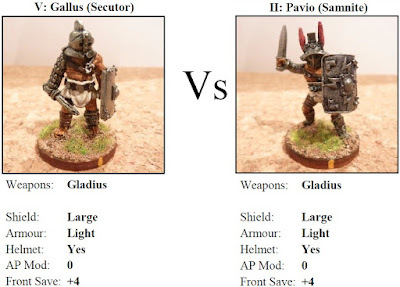 This fight in a small private indoor arena will pit GALLUS (Secutor, skills: dodge, attack, crowd pleaser, reflexes) against PAVIO (Samnite, skills: attack, dodge, reflexes, stamina, veteran) the Governor's new favourite. Athenodorus also commented that Pericles was going to be crucified in a few days, which was a pity in some ways because he would probably have made a good gladiator. But he was such a notorious gangster it was better to make a public example of him. Of course the capture of Pericles "by Athenodorus" (who as City Aedile was not responsible for law and order) was a huge boost to his reputation, after the responsible authorities had been "trying" without success for years. Many believed they hadn't been trying too hard because Pericles was protected by powerful friends who used his muscle for their own nefarious schemes. So Athenodorus might make enemies as well as friends by this. What is it with ancient Rome? There are never any fairytale endings. 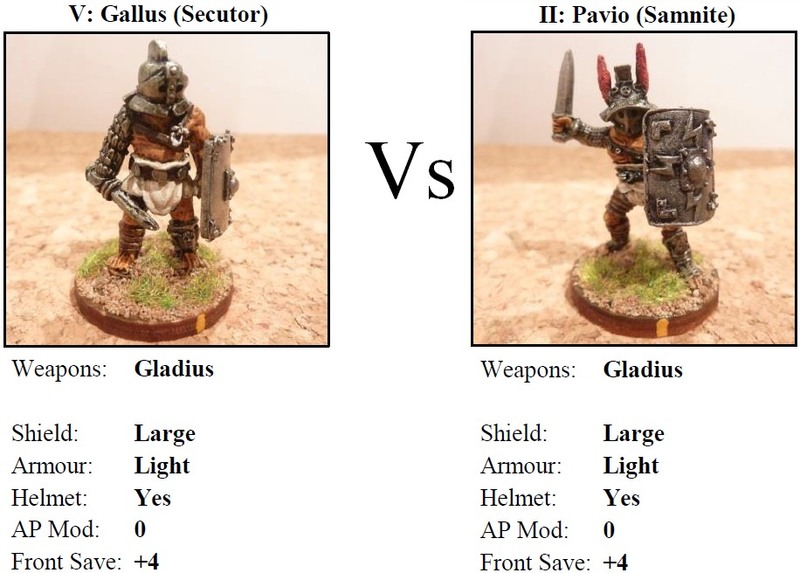 Despite their good stamina, both gladiators took to the fight with average strength, Gallus at 7, Pavio at 8. Gallus was certainly the better fighter, he attacked the shielded flank of Pavio. Pavio saved. Gallus attacked the unshielded flank of Pavio. Pavio saved. Pavio attacked, and failed every time, getting to 4 fatigues. Gallus attacked, a double 4, and Pavio was knocked down. The crowd, however, was still not impressed, and didn’t give out any favours. Neither had any wounds, and Gallus was looking the better, but the goddess Fortuna had other plans. Pavio rolled a 1 for AP. With the reflex skill, this was a reroll. Pavio rolled a 6. Pavio stood up and attacked. A double 2. Gallus was down. Gallus rolled a 7 on appeal. -2 for being unwounded, and -1 for not inflicting any. Thumbs down, the end……..
Ah well, he went out on a high! Yes, it was a good campaign. It was interesting how we both had different slants on each game, I was more so on the rivalry with another lanista, yours was more on a street gang. Both campaigns finished with the main antagonists dying on or about the same time the protagonists did, so the story arcs had some completion to them.